Being an Italian Jersey Girl, it’s almost a sacrilege, seemingly blasphemous, to suggest anything other than a Margarita pizza, resplendent with a Double Zero farina pizza dough tossed in the air for a thin crust that has a doughy yet crispy ring around the perimeter, topped with a fragrant San Marzano plum tomato marinara, fresh basil, and slices of fresh mozzarella. But, this Jersey Girl also happens to be vegan, so adaptations are in order. And, yes, today I still enjoy a vegan Margarita pizza, courtesy of the amazing Miyoko’s Mozzarella or my own homemade mozzarella. Alas, I have transgressed into the adventurous world of diversity. Thus, I give you my version of India Meets Italy. My freezer was beginning to fill up with leftovers from a variety of potlucks and culinary demonstrations. So today, I decided to use items in my freezer to create my dinner. 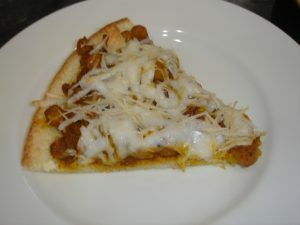 After culling through the labeled containers for inspiration, I came up with this Indian-inspired pizza. It’s a simple recipe, really. 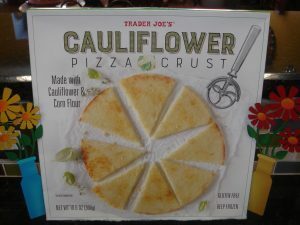 Starting with Trader Joe’s Cauliflower Crust, aka Gobi (Indian for cauliflower) crust. I baked it according to the package instructions, 12 minutes on each side, before topping it. I had made Masala-scented Chana for my last potluck and found a small container awaiting its next glory. It started with a large onion, diced, and sautéed until caramelized. Next up a masala slurry, which was a mixture of mustard seeds, cumin, coriander, chili, chat masala, ginger, and garlic. This got added to the onions, and fried until fragrant. Garbanzo beans (Chana, in India) were added, tossed until well coated, and simmered until they took on the aroma and flavor of the masala. Leftovers coming out of the freezer, I slathered them atop the Gobi crust, then topped them with vegan shredded mozzarella (okay, definitely not traditionally Indian, but this is where the Indian joined hands with the Italian). Back into the oven for an additional 5 minutes to warm the chana and melt the mozzarella. The crust was sturdy and flavorful. The cauliflower was evident. Definitely held its own beneath the aromatic chana. 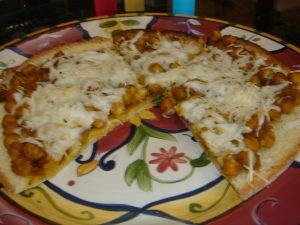 The chana, perched atop the crust, declared its Indian roots while complementing the Italian mozzarella. Whereas it was my dinner and made for a fabulous stand-alone, I think it would also be a superb finger appetizer at a cocktail party by cutting the slices smaller. A perfect beginning to awaken the palate for more to come. after dinner’ craving, or for that quick meal after a long day at work. Be sure to follow my weekly posts and keep your eye out for other yummy vegan dishes! Who Wants to Make Some Cake? A Limoncello Coconut Cake?